It’s finally here! Today, Sprint and Dairy Farmers of America (DFA) welcomed the nine companies participating in the sixth annual corporate accelerator program. The 90-day immersive program launches today and runs through June. Startups in three verticals — 5G Technology, Ag Tech and Dairy Food Products — will work directly with leaders from Sprint, Dairy Farmers of America (DFA), CoBank and other industry experts and mentors to create strategic, long-term partnerships. Bezoar Laboratories (Bryan, Texas). Bezoar’s current innovation is a patent-pending probiotic for cattle that, when paired with nitrate, decreases their methane production by 50%, while providing additional benefits. Numa (Bridgewater, N.J.). Numa makes all-natural sweet, chewy milk treat with just 6 natural ingredients and four grams of protein. You may be interested in meeting the founders and teams of these companies, so please keep the evening of May 15th on your radar for our Community Event — you’ll see an Eventbrite invitation a few weeks before the event. You can also see them at 1 Million Cups on May 15th. Since 2014, the Sprint Accelerator has worked with 45 startup companies. These companies have raised an aggregate of over $36 million since participating in the program. 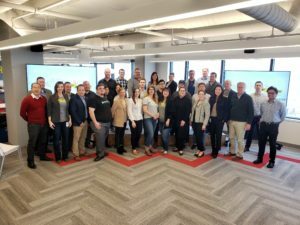 The Sprint Accelerator program culminates on Demo Day, June 27 at the WWI Museum, in which the startups showcase their companies and experience in the program.